When Chofetz Chaim Yeshiva was located in Forest Hills, the beis midrash was mostly underground. There were windows, but they were located near the ceiling and had to be opened using a ten-foot pole. It’s not really relevant to this article, but the following factoid begs to be mentioned. My future shadchan had the job of opening these huge windows at 5:15 in the afternoon to prevent the air in the beis midrash from becoming too stale. This took place even in the middle of the winter. Of course, as soon as the windows were opened, some bachurim sitting in the wrong location immediately felt a draft. This led to a repetitive comical routine whereas as soon as the windows were opened and the pole leaned against the wall, someone would take the pole and close them. Still, the quick burst of cold air was quite refreshing in the middle of a long afternoon seder. There was a side room that was only accessible through the beis midrash. This room was affectionately known as “the cave.” It had 20-foot-high ceilings, dim lighting, and exposed plumbing and wires. Random mysterious noises could be heard in the cave. If, due to unforeseen circumstances, someone came late or missed Shacharis, he was forced to daven in there. Those who davened there were known as “cavemen.” The cave housed huge bookcases where the young scholars were allowed to keep their private sefarim. Perhaps the holiest part of the cave was the Queens JEP office. After squeezing past some bookcases, there was a clearing large enough to hold a desk and copy machines. Who knows how many Jewish neshamos were saved due to the work centralized in that office? The cave had a large, heavy wooden door. To open it, one needed to grasp the door by the edge and pull. One day, a student in his second year in beis midrash decided to install a simple metal handle on the door. 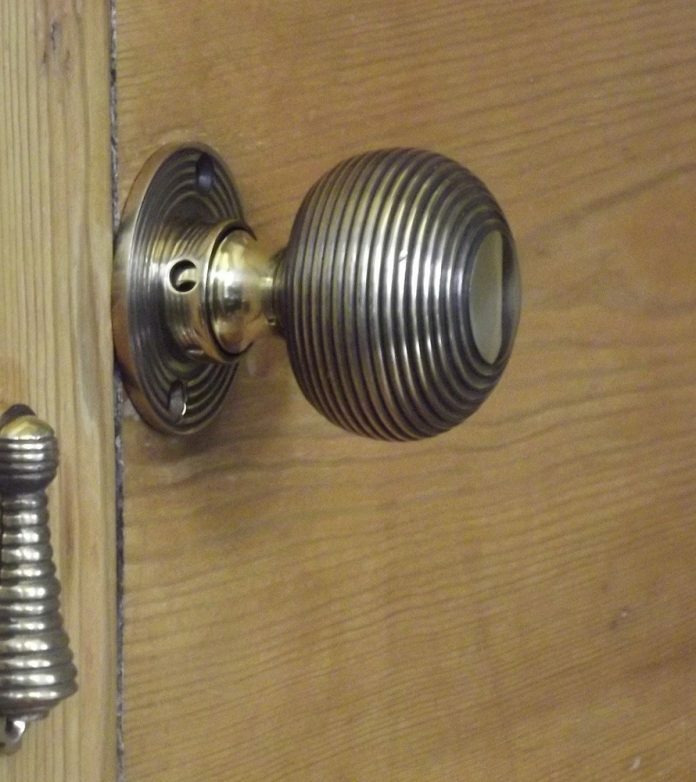 The handle required two screws, one on top and one on the bottom, to be affixed to the wooden door. The student received some mild pushback for making a unilateral change to the beis midrash without prior authorization. In the yeshiva in Kelm, one would have been expelled for such an action. Still, what could be wrong with installing a door handle in the beis midrash? Surprisingly, it violates a literal reading of a Taz. Hundreds of years ago, someone decided that he needed an elevated place in shul to hold his Siddur. For whatever reason, a shtender would not suffice. The congregant had an easy solution — he affixed a wooden beam to the wall to which he would attach his table-top shtender. The Taz was very upset with this solution. He reasoned that the congregant may have violated a Torah prohibition and certainly a rabbinic one. The Torah says in Devarim (12:2–4): “You must destroy all the sites at which the nations you are to dispossess worshiped their gods … Tear down their altars, smash their pillars … You shall not do so to the L-rd, your G-d.” The Gemara understands these final words as a prohibition against destroying the Beis HaMikdash. By extension, this applies as well to a shul or beis midrash. It is codified as practical halachah that one may not destroy a shul (O.C. 152:1). The Chofetz Chaim adds that this prohibition applies to the furniture as well. One may not destroy tables or benches used in a shul to facilitate prayer. However, one may demolish a shul in order to build a nicer one. The Taz was opposed to making a hole in a wall of a shul to facilitate a shtender because one is thereby demolishing the wall, albeit on a very small scale. The Taz says the only permit to destroy a wall of a shul is if one plans on rebuilding it. Here, the hole in the wall will not be repaired. It will be left as is. Therefore, even if one can argue that the hole serves a constructive purpose, nevertheless, it still violates the prohibition against demolishing a shul. One can argue that the installation of the door handle on the “cave” door created two screw holes in the door that served as a wall to the beis midrash. Wouldn’t this be forbidden according to the Taz? The Maamar Mordechai and others suggest that the Taz should not be understood simply. After all, the Taz agrees one can make a hole for a constructive purpose if it is repaired. Isn’t filling the hole with the peg of the wooden shtender considered a repair? In our case, wouldn’t the screws that hold the handle likewise be filling the holes? The Maamar Mordechai suggests that the Taz was referring to a situation where one made an indentation in a wall to be able to loosely rest a wooden board there, but the board did not fill the entire space. If the board filled the entire indentation, then the Taz would have permitted it. However, since the opening was bigger than the object to placed inside it, there would be a hole left after construction and that is prohibited. Even if the Taz was to be understood literally, and filling a hole with a peg would not qualify as a repair, the Beis Shearim says our door-handle holes would still be permitted. The reason why the Taz forbade the hole for the shtender was because it only served the needs of an individual. The Beis Shearim argues that even unrepaired holes that serve a communal need are permitted. Making holes for a public door handle is certainly a communal need. Finally, the Elya Rabba disagrees with the entire premise of the Taz. He rules that any destruction of a shul or beis midrash that is for a constructive purpose is permitted. To make a hole for a shtender, even for an individual and even if there will be a wide hole left over, is permitted since it is for a constructive purpose. The Mishnah Berurah (152:12) seems to side with this opinion. Therefore, installing the door handle by making holes in the door was permitted — except for the fact that it was unauthorized.